I picked up this record at some point within the past few years, either in some charity/second-hand shop somewhere, or from eBay. Having taken the opportunity to investigate my eBay history to see whether it was the latter, I realise that said history seems to effectively end – for me, at least – at December 2006. Items purchased before then are listed only by their IDs, rather than with the full details of what the item was. That’s kind of a shame, I think, as I would have enjoyed digging into the past and seeing what I had previously purchased and when. I guess it has to be that way, to stop the eBay servers exploding under the sheer weight of information that comprises every piece of data about every purchase ever made on the website. Still, it’s a shame. I can, however, see that my very first recorded purchase on the site was made on 23 September 2001, and that I was described as providing ‘Great communication & Extremely quick payment. Highly Recommended !! !’ according to the feedback. I still maintain my 100% positive feedback record, too. As other feedback comments would say, A+++ TOP EBAYER!!!111!! It has a great track listing. It’s nice to see that Rammelzee track on there, and exciting to read on the back cover of the record that it was produced by Jean-Michel Basquiat. I’m still eager to track down the album by a band called Grey, which featured – as I recall – both Basquiat and increasingly famous, legendarily shirty actor/director/polymath Vincent Gallo. 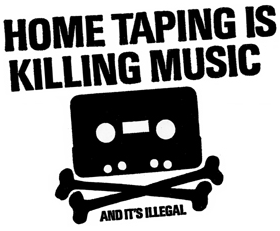 Home Taping Is Killing Music. Well, that’s what it says on the back cover. I wonder which record label genius thought up that line? The library in Wellington, Telford used to have this record in its collection. 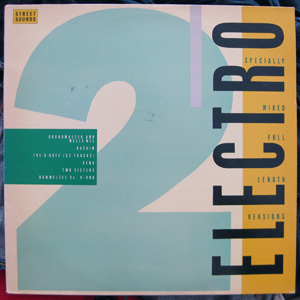 I used to work in this library in the late eighties, and remember it having a room full of records that could be loaned out, including a full collection of this Electro series along with a whole load of other breakdance/electro/acid-type compilations. I also remember the day that a lot of those records were sold off by the library to make space, and that I didn’t buy them all. I really wish I had have done, now! At the time I was more interested in buying up their older books, especially those covering any kind of magick/parapsychology/religion-type subjects which I was bizarrely interested in at the time.